While Sage Accpac provides some fantastic standard reports, you probably turn straight to Excel when it's time to get your hands dirty, play with the numbers, and make important decisions. That's why we think you'll like the new Sage Accpac Intelligence module – an Excel-based reporting and analysis tool that draws data directly from your Sage Accpac database. Let's take a closer look. Sage Accpac Intelligence provides Business Intelligence reporting in a familiar Microsoft Excel interface. With pre-formatted reports and built-in pivot tables, you'll be up and running quickly using what-if analysis and multidimensional OLAP cubes to make informed business decisions. Plus, you can modify existing report templates, create totally new reports, and save your settings & preferences, eliminating the need to update the spreadsheet each time you run a report. Accpac Intelligence can pull data from any Accpac module which means you can combine accounting, operations, CRM, and much more into a single location. This is an important distinction from the Accpac Financial Reporter which only looks at data from your General Ledger. And by pulling data directly from your system, Accpac Intelligence automatically recognizes your fiscal periods, chart of accounts, and detailed transactions. Accpac Intelligence will also connect to external ODBC databases or third-party software applications consolidating vast amounts of raw data across your entire company into a single, comprehensive reporting platform. This will save a tremendous amount of time and the potential inaccuracies of manually extracting data and cobbling together reports from a variety of sources. 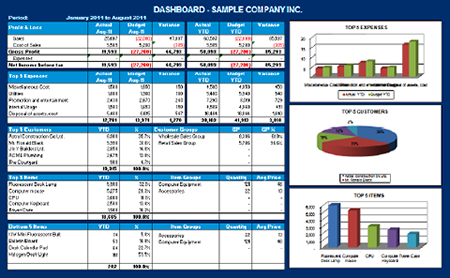 Accpac Intelligence includes Dashboard Analysis that provides a one-page summary of key business information like top customers, items, and expenses. “Dashboard Style” reporting is particularly useful in condensing vast amounts of data into a single snapshot that's easy to interpret at a glance (like the dashboard in your car!). You can view items in the dashboard in both text and graphical format so you get the information you need presented the way you choose. Plus, you get full drill down capability when you want more detail behind the numbers. Starting with Sage Accpac Version 5.6, Accpac Intelligence is included with your system and provides a FREE single user license so you can kick it around and experience first-hand the power of business intelligence reporting combined with the familiarity of Microsoft Excel. You can also get a preview of Accpac Intelligence through Free Introductory Training offered online at Sage University or you can contact us directly with your questions about this fantastic new feature for your Sage Accpac system.